NOTE: Game is 1024x768 resolution (full-screen) and may require small (96 DPI, Win 7) or Normal (100%, Win 8 and up) System Fonts to display properly. Many systems default to this setting. Also, video card settings or apps that artificially force windowed mode or "stretch" the screen may result in display issues. Please verify before requesting support or assuming the game is broken. Thanks! 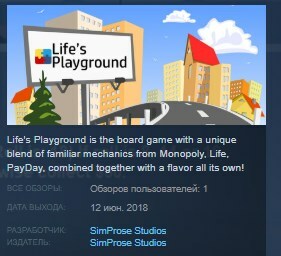 Life's Playground is the board game with a unique blend of familiar mechanics from Monopoly, Life, PayDay, combined together with a flavor all its own! It's designed to be easy to learn, and yet have many decisions for the player to make to influence the outcome. And each and every game is totally different! Get and quit hundreds of different jobs, go thorugh hundreds of different little life vignettes, and more! Random board generation every game and even every turn around the board! Only the streets stay the same each time. Play with 1 to 4 human or CPU controlled players via hotseat, so you can take a trip to the playground of life anytime! Unique old-timey music, graphics and feel. Play 6 different mini-games, draw from over 200 Fate cards with lots of different outcomes, and use the Fortune Point you acquire any way you like. Buy up to 3 randomly generated upgrades for your streets, making your opponents pay more when they land on them!